Getting engaged and planning a wedding are already stressful enough without having to worry about which stupid blender, or china set, or silverware to request on your wedding registry. Well, thanks to Domino's, you can finally ask your guests for a wedding gift you actually want and can agree on without question: a shitload of pizza. 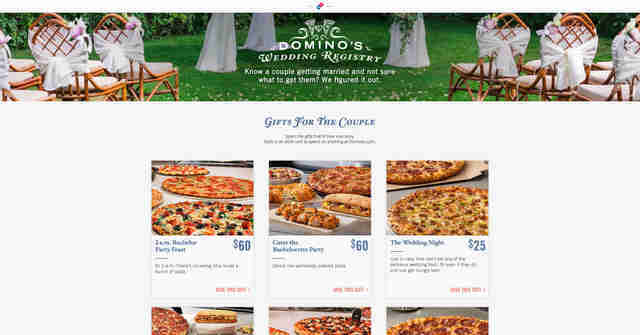 Domino's announced Wednesday it has launched the Domino's Wedding Registry, which allows couples to choose gifts based on their shared addiction to the chain's garlic-seasoned crust, chocolate lava cakes, and $5.99 choose any two coupons. How the world managed to get this far without a pizza wedding registry is unclear, but the national marriage rate is about the skyrocket. Or something like that. Interestingly, Domino's said the registry includes gifts for before, during, and even after the pizza-loving couple's wedding. The list of available gifts ranges from $15 to $100 and includes options like the "One More Slice Before 'I Do'" for $45, the "2 a.m. Bachelor Party Feast" for $60, and the "Post-Honeymoon Adjustment to Real Life" for $25. Couples will receive each gift in the form of a digital gift card. Just like other wedding registries, Domino's registry site allows couples to choose the gifts they want and share their list with loved ones on social media or via a unique URL. The site also lets wedding guests search for a registry by using the names of the future newlyweds and the wedding date. Basically, it's a pretty legit registry -- if you're into fast food pizza. You might want to set up a separate registry for other gifts, too, though. Believe it or not, the new service is based on actual customer demand. 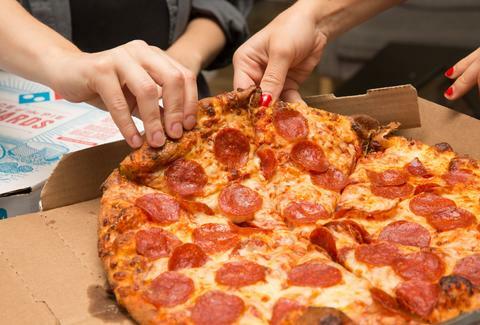 "We hear often from customers that Domino's was a part of their big day, from proposals to after-hours meals at their wedding," Jenny Fouracre, a Domino's spokesperson, said in a statement. "We wanted to make it easier for people to ask for and receive something that they'll really use." We would say good luck tying the garlic knot, but Domino's sadly doesn't make 'em. In that case, cheers to many years of parmesan bites and cheesy bread. Tony Merevick is Cities News Editor at Thrillist and can't imagine why anyone wouldn't sign up for this. Send news tips to news@thrillist.com and follow him on Twitter @tonymerevick.